You can take your pick of anniversaries to celebrate in any given year, but I think my favourite for this year will be the bi-centenary of the birth of Charles Dickens. I went to school in Chatham, which is very much Dickens country, and quite honestly you can get a bit over-Dickensed there; to this day I have an aversion to David Copperfield, one of his most popular books, having been dragged unwillingly through it at a tender age. It actually took twenty years after that for me to read Dickens without being forced to, but we get along just fine now, Charlie and me. I decided to give 'Great Expectations' a try, and I loved it. 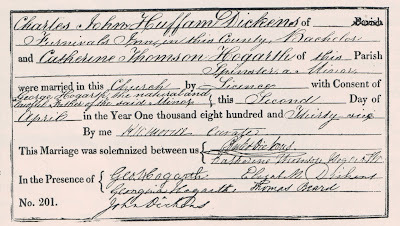 You might wonder what works of fiction have to do with family history, and the answer is - quite a lot, as it happens. One of the reasons I think I found Dickens rather heavy going first time round was having to read the whole book in one go. That's not how Dickens' eager Victorian audience read them; the stories came out in instalments, often ending on a cliffhanger so that the next would be all the more eagerly anticipated. Since each section would be about the same length, sometimes they would go off at an apparent tangent so that the story would reach exactly the right stage on its last page. These little diversions might have little relevance to the plot, but are a goldmine of information on everyday life in Victorian England. For example, the picture above illustrates a visit to the hairdresser in Martin Chuzzlewit. You don't get that sort of detail in a dictionary of occupations. This is just one of many examples of passages in Dickens' novels that shed light on occupations in early Victorian England. I picked it because I happen to have an illustrated edition of Martin Chuzzlewit, but there are plenty more. And there are insights into other aspects of Victorian life and society. The stories may be pure fiction (and we can leave the question of Dickens' attitude to women and his female characters for another time) but they are set in a very real world. And if you have English ancestors it's a world you should be interested in. Dickens didn't just write fiction, although that's what we remember him for. 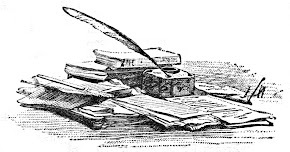 He wrote a number of non-fiction, mainly travel, books, and he was also a journalist, contributing to and editing a number of journals throughout his career. They make interesting reading, and there some extracts I will write about during the year. 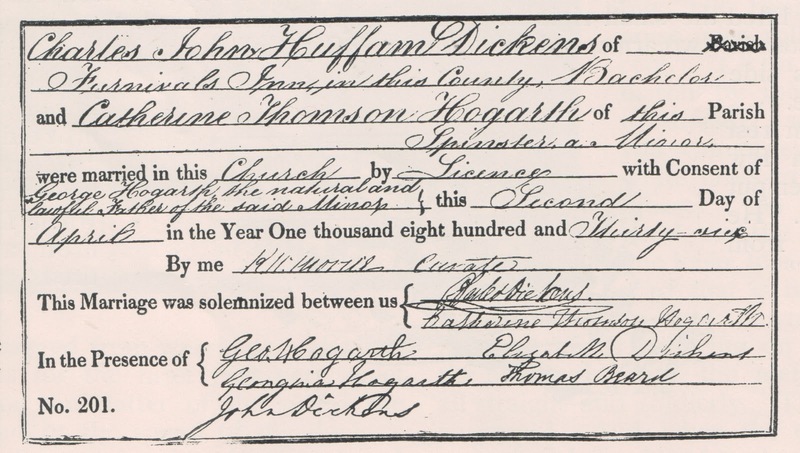 In the meantime, for some genuine practical genealogy here is a copy of the entry in the parish register of St Luke Chelsea recording the marriage of Charles John Huffam Dickens to Catherine Thomson Hogarth in 1836, and for a pre-1836 marriage it's more informative than most.